At California Eye Surgeons, the health of your child's visual system is our priority. If visual deficiencies are not corrected during the critical developmental period, they can lead to lifelong deficits in your child's vison. 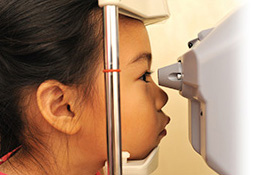 We use the latest technologies and examination techniques to obtain an accurate assessment of the status of your child's visual system. This allows us to develop an individualized treatment plan to optimize your child's visual potential. Please find below some common questions and concerns. Of course, we will take the time during your visit to discuss these in further detail with you. My child did not pass the vision test at school/pediatrician's office. A comprehensive eye exam is recommended to rule out the need for glasses and any ocular abnormalities. Any vision or ocular concerns should be treated early to ensure proper visual development. Please schedule an appointment with an optometrist or ophthalmologist focusing on children's vision. Ophthalmologist are physicians (M.D.) specializing in the eyes. After earning a Bachelor's Degree, they attend four years of medical school then complete an additional four year residency focusing on the eyes. Ophthalmologists are trained to perform primary care eye exams, treat all eye diseases and perform eye surgeries. Ophthalmologists work with optometrists to ensure the best glasses and contact lens prescription for the patient. Optometrists (O.D.) are primary care eye doctors. After earning a Bachelor's Degree, they attend four years of optometry school to learn about the eyes. They are trained to perform primary care eye exams, treat certain eye diseases, and have extensive training in glasses and contact lenses. Optometrists work with ophthalmologists to care for patients who require eye surgery or have eye diseases associated with a medical condition. Opticians are trained to fit patients with the best glasses possible from the prescription provided by an optometrist or ophthalmologist. They are knowledgeable in the different lens and frame designs available. Some opticians are also prepared to teach patients how to utilize contact lenses. What should I expect at my child's first eye exam? Foremost, a medical history form will be completed for the examining doctor to review. Your child will first see the medical assistant (MA) who will help start the exam. The MA will take an initial measurement of the eye behind a machine called an autorefractor – this gives an estimate of your child's focusing error. Then, vision at distance and near, depth perception, and color vision will be measured. When the child sees the examining doctor, eye alignment, prescription measurement, and eye health evaluation will be completed. The doctor may use a phoroptor (big mask with lenses inside) or a retinoscope (special flashlight) to help measure whether glasses are needed. A microscope and special magnifying lenses help to evaluate the health of the eyes. Eye drops may also be indicated to complete the exam. What is a cycloplegic exam? Why should my child be dilated? Eye drops are used to help us to further evaluate vision and eye health. Firstly, the eye drops will cycloplege (fully relax) the focusing muscles of the eyes, allowing for a more accurate glasses measurement. This is especially important for children in the treatment of amblyopia (lazy eye) and strabismus (eye turn). Secondly, the eye drops will also dilate (enlarge) the pupils. This will allow us to evaluate the health of the eyes. This is important to rule out any eye diseases or abnormalities that may be affecting your child's vision. Amblyopia is reduced vision in one or both eyes due to uncorrected vision conditions early in life. If the brain does not receive maximal visual input during early childhood, vision does not fully develop. Amblyopia is best treated early while the brain is still developing vision. What is strabismus (eye turn)? Strabismus is when the eyes are misaligned. Eyes can turn in, out, up, or down. One or both eyes can be affected. Eye turns can be present constantly or intermittently. Strabismus can lead to amblyopia..
What is patching? Why does my child need to be patched? Patching is used to help treat amblyopia. In many cases, glasses are prescribed and this alone resolves the amblyopia. However, in cases where vision does not improve with glasses alone, or the vision improves asymmetrically, patching is then recommended. Patching completely occludes the stronger eye in order to force the weaker eye to be visually stimulated. Myopia is a focusing error where objects far away are blurry, but objects up close are clear. This is not a disease and is correctable with glasses / contact lenses. Hyperopia is a focusing error where it is sometimes more difficult to see closer objects than ones far away. If there is a large focusing error, it can be difficult to see clearly at all distances. Hyperopia can lead to amblyopia. This is not a disease and is treated with glasses / contact lenses. Astigmatism is where the front curvature of the eye is not completely spherical. Instead there is more curvature vertically or horizontally. This usually causes some blur at all distances and can lead to amblyopia. This is not a disease and is treated with glasses / contact lenses. Anisometropia is the imbalance in focusing error between the two eyes. This can lead to amblyopia if one eye is used more than the other. This is not a disease and is treated with glasses / contact lenses. If I wear glasses, will my child need glasses too? Genetics do play a role in the growth and development of the eyes; however, it does not necessarily mean that your child will need glasses too. If either parent wears glasses, it does increase the chance that the child may need glasses, but it is not 100%. Will wearing glasses / contact lenses now improve my child's vision so they will not need glasses / contact lenses in the future? Glasses help to compensate for the child's focusing error. It will help the eye do what it can't do for itself: see clearly. However, it is not expected to "cure" the focusing error or the need for glasses. If your child has amblyopia, glasses can play a role in treating amblyopia. Will wearing glasses / contact lenses make my child's vision worse? Glasses are a tool to help your child see clearer; thus, it is expected to help, not hinder the child's vision. It is in front of the eyes and do not touch the eyes; therefore, does not change the eyes themselves. As the child grows, the eyes also grow and the prescription may change accordingly. The prescription is changed to match the eye. Will my child become dependent on glasses / contact lenses after wearing them? If your child is using the glasses more, it may seem they are dependent on them. More likely, your child realizes the glasses help to make things clearer and when the glasses are removed it is blurry. Once your child learns what clear looks like, they will most likely prefer to see clearly and thus, may prefer to wear the glasses more. It is always recommended to protect against ultraviolet (UV) radiation from the sun. Sunglasses are recommended for everybody, even babies if they will be tolerated. Extensive UV exposure can lead to earlier development of cataracts and changes to the front of the eye. What is the purpose of sports goggles? Sports goggles protect the eyes from injury. While bats and balls can obviously injure the eye, body parts can also inadvertently make contact with the eye including fingers, elbows, and feet/shoes. Please play safely. What foods or vitamins can help improve my child's vision? Studies have shown that lutein and antioxidants may help to delay some age-related eye diseases in adults. However, no studies have been completed on children or on vitamins alone. Vitamins are not expected to decrease the need for glasses or prevent the need for glasses.Vitamin A is necessary for the function of vision, but a moderate amount incorporated in a regular diet is sufficient. Extra carrots and extra Vitamin A is usually not indicated; Vitamin A overdoses can occur. The best nutrition for the eyes is also what's best for the body since the eyes are connected to the rest of the body. Will reading in dim light or sitting too close to the television damage my child's eyes? No permanent damage is expected; however, the eyes may have to work harder and this can cause temporary eyestrain. What signs should I look out for that might indicate my child has an eye or vision problem? Squinting, rubbing, or constant blinking of the eyes. Eyes that turn in or out. Discharge coming from the eyes. Sitting too close to the television. Head turn or head tilt. Sometimes, there are no signs and no complaints from the child.owever, the eyes may have to work harder and this can cause temporary eyestrain. Amblyopia (lazy eye): Reduced vision in one or both eyes due to uncorrected vision conditions early in life. If the brain does not receive maximal visual input during early childhood, vision does not fully develop. Amblyopia is best treated early. Anisometropia: Imbalance in focusing error between the two eyes. This can lead to amblyopia. Astigmatism: Front curvature of the eye is not completely spherical. Instead there is more power vertically or horizontally. This usually causes some blur at all distances and can lead to amblyopia. Cataracts: Changes in the lens inside the eye that causes opacities in a structure that is usually clear; this can lead to blurry vision and/or glares and halos around bright lights. Most commonly, this is a normal age-related change. However, cataracts can also be abnormal changes due to various factors including: a congenital anomaly, ocular trauma, or as a side effect of a medication. Cataracts can be surgically treated. Cornea: The clear structure towards the front of the eye that covers the iris and pupil. Cycloplegia: The focusing muscles are fully relaxed. This is achieved using eye drops and allows the doctor to more accurately measure the glasses prescription in children. Patients may notice increased sensitivity to light and blurry vision while the eye drops are in effect. Dilation: Pupils are enlarged using eye drops. This allows the doctor to evaluate the health inside the eyes. Patients may notice increased sensitivity to light and blurry vision while the eye drops are in effect. Floaters: Changes in the vitreous of the eye that can manifest as little dots or squiggly lines that move around. A few is usually normal and more of a nuisance than it is dangerous. However, a sudden large floater or a sudden swarm of floaters can indicate more precarious changes in the eye and should be examined immediately. Glaucoma: Degeneration of the optic nerve leading to vision loss. Patients tend to lose their peripheral (side) vision first, leading to a "tunnel vision" effect. There is no cure for glaucoma, but eye drops and surgical intervention can help to slow disease progression. Hyperopia (farsightedness): Focusing error where it is sometimes more difficult to see closer objects than ones far away. If there is a large focusing error, it can be difficult to see clearly at all distances and can lead to amblyopia. Iris: The color part of the eyes. This is essentially a muscle and is less visible when the eyes are dilated. Lens: The clear structure inside the eye that focuses light onto the retina. As the lens ages, it can yellow and develop opacities with time causing cataracts. Myopia (nearsightedness): Focusing error where objects far away are blurry, but objects up close are clear. Optic nerve: This is the "cable" that sends all the visual information that the eye collects to the brain (where it will be analyzed). Damage or changes anywhere along the optic nerve can affect vision. Pinguecula: Changes in the white part of the eye from prolonged UV exposure from the sun. This can continue to progress onto the cornea and become a pterygium. Pterygium: Extra growth from the white part of the eye extending onto the cornea. This damage is caused by prolonged ultraviolet (UV) exposure from the sun. Pupil: The black part of the eyes; it is essentially a hole and acts as a window into the eye. When patients are dilated the pupil enlarges. Retina: The inside lining of the eye that collects vision information to send to the brain. Strabismus (eye turn): Eyes are misaligned and can turn in, out, up, or down. Eye turns can be present constantly or intermittently. One or both eyes can be affected. Strabismus can lead to amblyopia. Vitreous: The jelly-like structure that fills the inside of the eyeball. With time, this structure loses its cohesive shape, the fibers move around more, and this can stimulate the appearance of floaters.